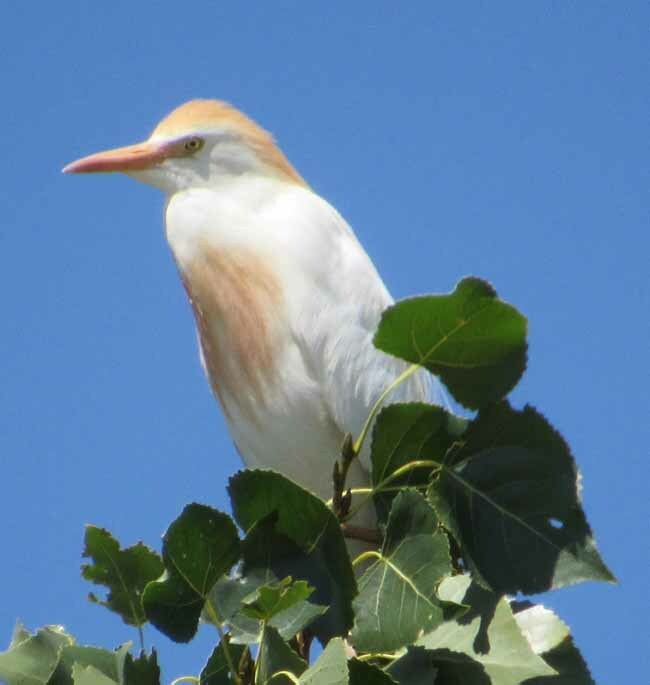 This morning the neighbor’s tree was covered in African cattle egrets, a breathtaking sight. Since first appearing in the Rio Grande Valley forty-odd years ago, these migrants have multiplied and made themselves very much at home. Their numbers seem to have increased greatly just in the last couple years. The neighbor was irrigating his alfalfa field, and possibly the birds were waiting for the nice juicy insects to flee the advancing water. Or possibly this flocking was mating behavior— the reddish blush on the chest and head indicates that it’s mating season. In any case they’re handsome birds, and an ornament to any neighborhood. They’re welcome to chow down on my insects any time. Next post: Literalize That Metaphor!